Marianne Daventry will do anything to escape the boredom of the town she lives in and the amorous attentions of an unwanted suitor. So when an invitation arrives from her twin sister, Cecily, to join her at a sprawling country estate, she jumps at the chance. Thinking she’ll be able to relax and enjoy the beloved English countryside while her sister snags the handsome heir of Edenbrooke, Marianne finds that even the best laid plans can go awry. From a terrifying run-in with a thief to a seemingly harmless flirtation, Marianne finds herself embroiled in an unexpected adventure filled with enough romance and intrigue to keep her mind racing. Will she be able to rein in her traitorous heart, or will a mysterious stranger sweep her off her feet? Fate had something other than a relaxing summer in mind when it sent Marianne to Edenbrooke. I have officially made it to my 100th review, and the first thing I have to do is say a huge thank you to GCR follower brendajean for recommending this book, Edenbrooke, to me. Let me tell you how GOOD this book is: I picked it up this morning on my way to work, and finished it by the time I got home. And while I was at work, I couldn't stop thinking about it and it actually hurt me to put it down! The author, Julianne Donaldson, does the most incredible job of just creating these characters that you instantly fall in love with and care deeply about. Marianne, our heroine, is the woman who refuses to be stuck in the box that everyone else places her in. She doesn't want to be "the elegant lady" she's supposed to be, and refuses to change. Her character is strong, witty and so loveable. And then you have Philip. What can I tell you about Philip?....I'm in love with him, lol. Philip is the man that every girl dreams of - he is hilarious, he's charming, he's caring - he's perfect. I can't tell you too much about the drama that ensues between Philip and Marianne, but suffice it to say that it will sweep you off your feet. Excellent review -- so good that I went out and bought this book right away! It looks like just the sort of book I would love! Thanks for the review. 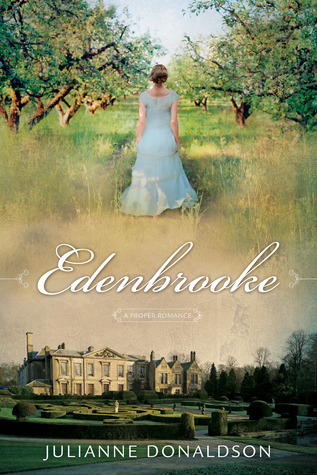 Great review, Edenbrooke sounds like a great story and I'm happy to have heard about it. Wow! I'm going to have to add this to my TBR list. It sounds fantastic!